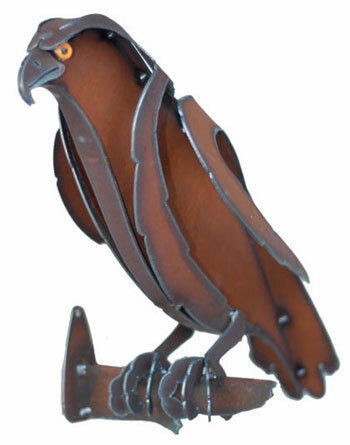 New to the Dupere Garden Sculpture Collection...the Hawk, a beautiful bird, & a noteworthy garden sculpture!. The Hawk...a bird of splendor! In mythology the Hawk is considered to be a solar bird & is associated with the Sun Gods. Since the beginning of recorded history the Hawk, as a bird of prey, has been both despised & revered. The hawk is a keen-eyed & efficient hunter & is widely reputed to have visual acuity several times that of a normal human. The hawk generally hunts by sudden dashes from lofty perches. Hawks weigh 2 to 4 pounds & are about 22" in length, with a wing span of 56". The hawk has a strong hooked beak, its feet have three toes pointed forward & one turned back, & the claws or talons, are long & curved, & are razor sharp. Hawks kill their prey with the long talons. The average lifespan of a hawk in the wild is 20 years. A full-time artist living in Arizona, Henry Dupere is a skilled & passionate metal sculptor. 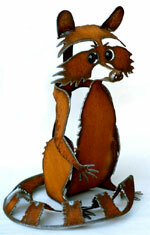 His imagination, sense of humor & love of nature are expressed in his unique rusted metal sculptures! All of the garden art sculptures in the Dupere collection can be used to add a touch of distinction to any garden or home decor. Henry Dupere Hawk Rusted Metal Garden Sculpture. Three-dimensional rusted metal hawk garden sculpture. Hawk eyes: realistic taxidermy glass-like eyes featuring superior craftsmanship.